Vadim Gherasimov is a male forward from Moldova, Republic of, who has been playing for FC Milsami in Moldova, Republic of since July 1, 2009. Vadim Gherasimov did not played any matches this season. The 36-year-old footballer was born on December 22, 1982 and is therefore ten years older than his team's average age. These days, his team FC Milsami comes second place in Divizia Nationala (Moldova, Republic of). Vadim Gherasimov wears the jerses number 20 strip at FC Milsami. Before joining FC Milsami, he was not engaged in the squad of another professional team. His squad lost 60% (60% home) in Divizia Nationala. The highest win streak of the last 5 matches counts 2. 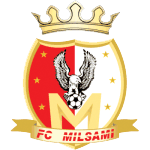 Apart from Vadim Gherasimov, Ion Ibrian, Sergiu Platica, Vergiliu Olaru and Daniel Ciobanu are also forwards of FC Milsami.